Patrice Cormier heading overseas to play with the KHL’s Barys Astana has left the captaincy of the Manitoba Moose vacant and in need of filling for the 2018-19 season. Cormier, who was the last man standing in the Ilya Kovalchuk trade more than eight years ago, wore the ‘C’ for the Winnipeg Jets’ AHL affiliate for the last two seasons, and in 2017-18, set career-highs in goals and points. The captain of an AHL squad is a more integral individual to a hockey organization than many think, and the Jets are no exception. Having a slightly older, more seasoned guy is key in helping young players and prospects — sometimes just teenagers with scratchy voices and scraggly beards — cut their teeth in pro hockey, adapt to gruelling new demands and pressures, and learn to conduct themselves properly. The AHL captain, at the end of the day, plays an integral role in helping fledgling talent become NHL-ready by acting as a mentor, both on and off the ice. With Cormier out the door, here’s a look at three potential candidates for the next captain of the Moose. Having just turned 25 years old, JC Lipon can no longer be considered a “prospect.” His window for being a full-time NHLer is closing, which would make him a suitable AHL captain. The Regina native has been a loyal foot soldier with the Jets’ minor-league affiliates, spending two years with the St. John’s IceCaps and the last three with the Moose. 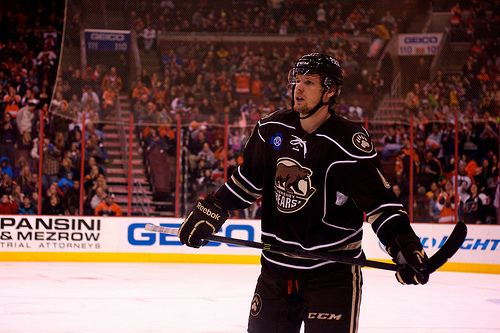 A relative veteran of 331 AHL games, Lipon is a feisty, dedicated player who is always in the thick of things. He also has some offensive skill, tallying 165 points in his five seasons and two hat tricks in 2017-18. The only downside is he wouldn’t be able to school the rookies on life in the NHL — he’s only played nine games for the Jets. It’s also worth noting he’s a restricted free agent and did not elect for arbitration, which means the Jets will have to re-sign him if they want him to lead their AHL squad. 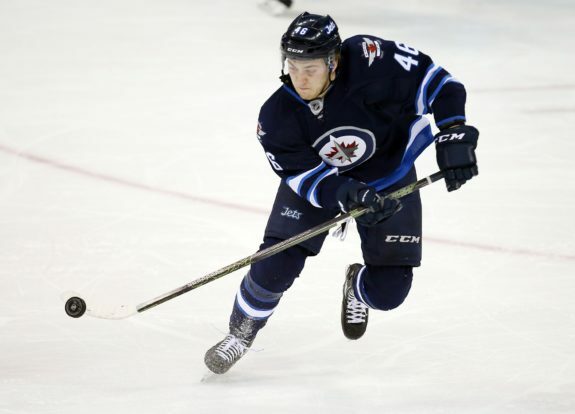 In his first season in the Jets’ organization, journeyman defenceman Cameron Schilling played a major role in transforming the Moose from basement dwellers into to competitive club. The eight-year veteran of more than 400 AHL games became a stable mainstay on the blue line, tallying 32 points and an outstanding plus-25 plus/minus rating. Schilling has experience and a calmness about his play — two good traits of a captain. Unlike Lipon and Melchiori, the 29-year-old under contract, having inked a one-year, two-way contract with the Jets on the opening day of free agent frenzy. It would be hard to imagine a scenario in which Schilling is not granted at least some kind of letter the fall. The third man who could claim the captaincy is another defenseman and a local product. Winnipegger Peter Stoykewych has played for the Moose for three seasons and has steadily improved each year; he’s gone from someone who bounced in and out of the lineup to a regular, reliable contributor. He recently signed a two-year extension with the team. Stoykewych, who possesses a heavy shot and good speed, set career highs in goals and assists in 2017-18. His plus/minus was plus-28, even better than Schilling’s. It’s hard to wrap your head around the fact the hometown guy will be considered a “veteran,” as he’s only in his mid-twenties, but with a trio of campaigns under his belt, he truly. That speaks to how young the majority of players on AHL teams are these days — and how important the presence of an older player is. The familiarity factor could also come into play — Stoykewych is from Winnipeg and undoubtedly knows the city’s landscape. That could give him a leg up over Lipon or Schilling. Given the departures of many of the older Moose members to other organizations — such as Buddy Robinson, Mike Sgarbossa, and Julian Melchiori — it’s quite feasible the Jets will ink players to shore up their minor-league depth. It’s only mid-July, after all. One of those potential new players may be suitable to lead the squad come fall.